Hi Swifty, can you please introduce yourself? Who are you, where do you come from, and what are you doing? Hello, my name is Ian Swift but I’m best known as Swifty. I live in west London but originally I’m from “up North” between Manchester and Liverpool. I’m the son of a magician, a devoted typografik artist, a black music lover and the father of two feisty teenagers, a star wars obsessed 8 yr old and partner to the infamous ‘JanineDingwalls’ – resepec! You are the first Mo’ Wax designer, tell us more about the hook up with James Lavelle and how it all started. Not long after I left Neville Brody’s studio, where I was working on The Face and Arena magazines, I got together with the Straight No Chaser crew and moved into a basement studio in Hoxton in East London. Back then Hoxton was pretty much derelict. It was home the Brit Art crew. That was back in the early Nineties… a very young James Lavelle – ‘The Holygoof’ as he called himself – walked into the Straight No chaser office one day and told us we needed him! We liked him. He must have been 16 or 17 and he was living in Oxford but working in Honest Jon’s record shop. It was his boundless energy and geeky knowledge of all things beats, hip hop and jazz that secured him a column in the mag. 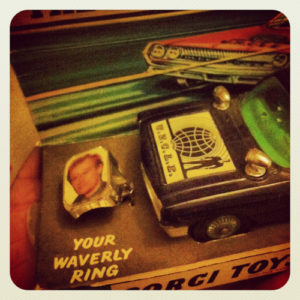 ‘Mo Wax please’ and it was as much about the language and style as much as the music. Around the same time Gilles Peterson and Patrick Forge’s legendary Sunday session ‘Talkin’ Loud & Sayin’ Something’ had just ended and been forced to move to Underworld. The landscape of London’s clubland was very different from now. We were just about to start doing Talkin’ Loud at the Fridge in Brixton. That was a big session. When I say “we” I mean myself and Janine – my partner of 25 years plus. She promoted the gigs for Gilles Peterson and I inevitably designed the flyers and associated grafix. 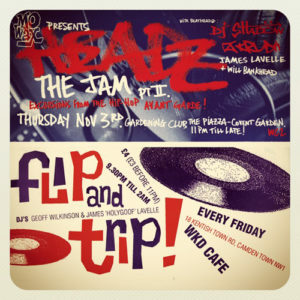 James was a permanent fixture at all these gigs and as he lived around the corner from us in West London it wasn’t long before he was part of the regular guest list crew! 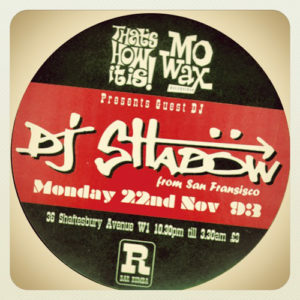 Who was working at Mo’ Wax at the time? How was it? In the early days it was just James! He was on a mission. A little later he employed a young lady by the name of Tracey Myerscough who was also a regular at all the clubs. Towards the end of my time I also dealt with Tim Goldsworthy and even James’ brother. You’ve created the first graphic identity for the label with your very own style, but slightly different from the Talkin’ Loud one. Did you have carte blanche? Especially, did you decide to switch from the white sleeve with stripe to the full color covers? 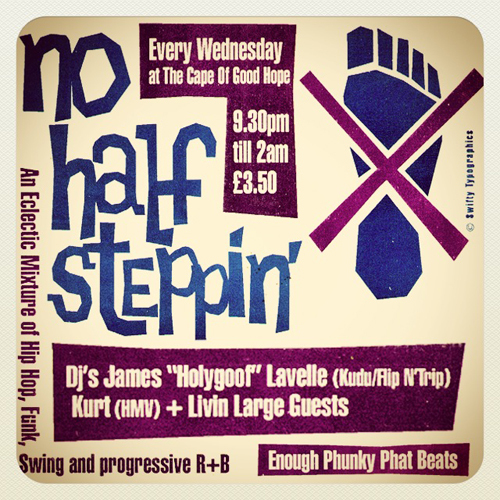 Straight No Chaser was flyer central and James had got me to do club flyers for his new sessions. He had moved to London full time and was active DJ’ing and connecting with so called ‘acid jazz’ scene. James was mad keen and it was a logical progression when he started Mo’ Wax. He asked me to do the logo. I just did pretty quickly for what I remember. Back then, we were on it 24 x 7. If weren’t clubbing we were working. There were a lot of late nights. Lots of herb and “vibesin’” different ideas. It was all very relaxed affair – just me doing my stuff for a mate, which is what I’ve always done. He might have paid me 50 quid or something – can’t remember! I just did my thing. The white sleeves with the stripe down the side? There was no money for expensive sleeves and packaging then – it was all done on a shoestring and a lot of belief! The idea of the stripe came from the belly-wrap which we’d seen on Japanese imports, particulary the Blue Note LPs which were floating around the Straight No Chaser office at the time. It was my idea to do something that could be knocked out quickly. Then when the label started to gain momentum James decided he wanted full sleeve grafix and enlisted the talents of Futura2000, Req and various other artists. From day one James always had a very fixed idea of what he wanted unlike the other labels I worked for who didn’t. It was a refreshing meeting of minds but after a while it became clear that we had different visions. You’ve also designed the iconic Mo’ Wax logo. The second and definitive version that first appeared on DJ Krush’s Strictly Turntablized LP is not as Swifty-ish as the first one. Did you design it too? That logo kind of evolved. Like I said James had ideas and unlike other clients he was interested in more collaborative approach. 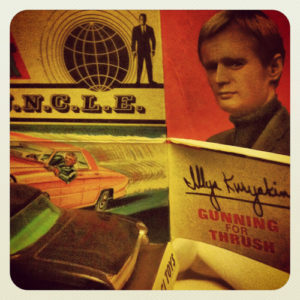 I think it was Will Bankhead who took a photograph of the logo on the B-side – it was a bit blurred and kinda broken up. I cleaned it up a bit in photoshop and chopped out the background and that became the logo that most people recognize today. The clash of old skool lo-fi techniques and new technology played a vital part in all of this. When I designed the very first Mo’ Wax logo the Apple Mac, as a tool for graphic designers, was in its infancy. There was no photoshop! Nobody had scanners! The reason why a lot of that early stuff of mine looks the way it did was because of the fact that it was all designed in ‘Freehand’ the precursor to Illustrator. Your last sleeve for Mo’ Wax was ‘The Beast’ by Palmskin Productions if I’m correct. Was your role at Mo’ Wax totally over then? When James signed Mo’ Wax to A&M records that was the beginning of the end for me. I had always worked with James on such a one to one level – it was more organic and for me anyway wasnt like doing a job or dealing with a regular client, to me it was much more like just having a laugh ! By the time he’d moved to a new office in kings X I was already out of the picture. He’d surrounded himself with new designers and new crowd of younger people more his age and more in tune with what he was doing. So in the end we just went our different ways. Enough water has passed under the bridge as they say and I still feel as though I lost a friend rather than a client ! What has been going on after the Mo’ Wax days, and now? Do you work for other labels or companies besides your personal projects? Wow that’s over 20 years ago! You have to remember, Straight No Chaser magazine was the hub around which a whole bunch of music crazy communities around the world gravitated. Mo’ wax was one phenomenon that came out of that scene. 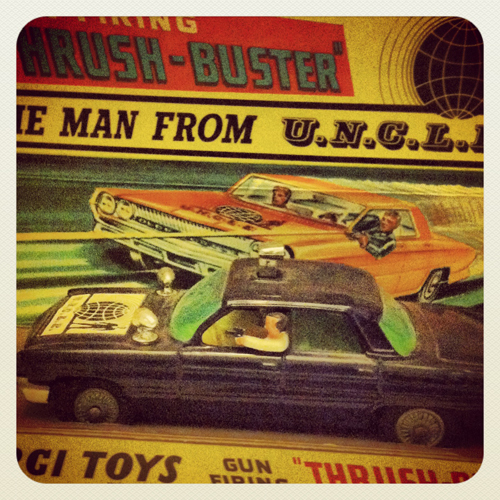 I art directed Chaser for 94 issues. It finally shut down 5 years ago but I still do projects with Paul Bradshaw, the publisher and editor. Straight No chaser is still my true family. We worked in New Zealand last spring where I did a presentation at the Semi-permanent conference with people like Ron English and Industrial Light & Magic. We also put together a serious exhibition of original art works and photography celebrating Jamaica50 and the impact of reggae in the UK. Apparently, 30,000 people saw that show. I think I’ve been lucky ‘cause I’ve managed to do large bodies of work… Chaser, Talkin’ Loud, Far Out, Especial, MELT2000… and I think that’s probably quite unique. I’ve done film and TV titles but I still operate out my shed and have done several exhibitions of my own more personal art work. 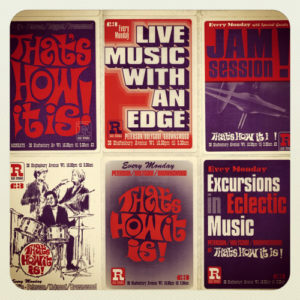 For anyone who’s interested they should take a look at my website www.swifty.co.uk . But essentially I’m around, still experimenting and knockin’ it out, but older, wiser and even harder to pin down! I don’t know about that… in the beginning it was really fun. 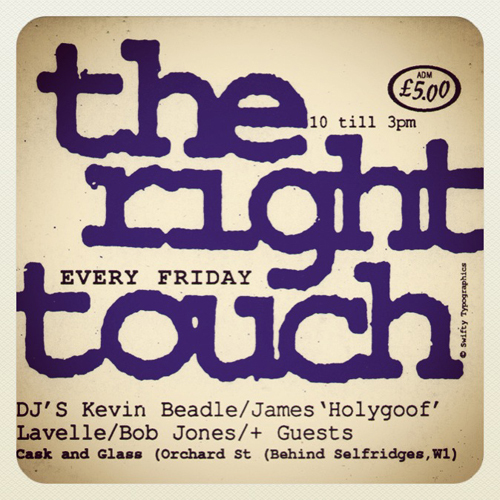 There was a serious energy at work during that era of London club culture. 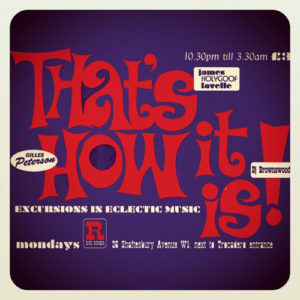 Loved those Monday nights at ‘That’s How It Is’ at Bar Rumba. The Blue Note club was virtually next door to the Chaser office. It hosted Coldcut, Norman Jay, Bob Jones, Gilles Peterson’s Far East, Metalheadz, Anokha… the very first gig that Shadow did with DJ Krush Those days will always have a special part in my heart. Although things didn’t turn out the way I’d have liked I still have a fondness for “The ‘Goof” and the whole Mo’ Wax adventure. It was part of my life. Sadly, it appears I’ve been erased from Mo’ Wax’s history. It’s a bit weird and I don’t really understand, I have felt at times a little bit like Lord Voldemort, “he who shall not be named !” But the art work exists and it doesn’t alter that fact that a solid foundation for Mo’ Wax was built during that period in Hoxton. Hopefully this interview will help people discover my true involvement with the label. I’m sure you have plenty of funny anecdotes about Mo’ Wax, please tell us something we don’t know yet! Ha, I’ve got loads but you’d have to get me in a room with James, the UFO boys, a bottle of Black & White whiskey, some phat beatz and some even phatter blunts! 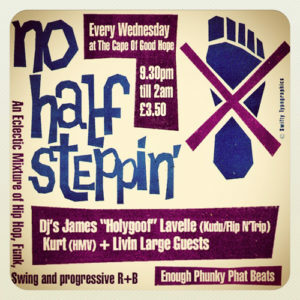 Still deep in the shed still kickin’ more Phunk than a Shaolin monk! I got more styles than the government got files! Never could spell. P.S. watch out for my new project with Mr Bradshaw www.stereophonic-supply.co. Alternative forms of diggin’- comin’ soon to a computer near you! I had a collection of old Dinky and Corgi toys on the top shelf of my studio in Coronet St above all the records and books. 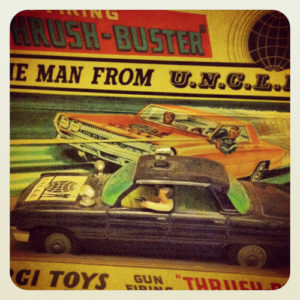 James spotted the Man from U.N.K.L.E ‘Thrush Buster’ and went ballistic – it touched a nostalgic nerve! On the next sleeve he instructed me to put a logo on the back ‘ A MEN FROM U.N.K.LE. PRODUCTION ‘ I changed the gun into a doobie and the rest as they say is history! 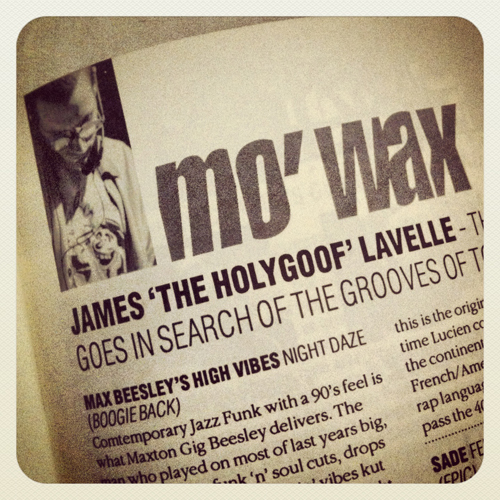 Pingback: Watch : James Lavelle, the Man from UNKLE | Mo' Wax!